Recently, on November 18th, Acumatica announced that it had raised $10 million in funding. At first $10 million didn’t look like that much to me because Xero, a SaaS ERP product aimed at smaller companies, announced on October 14th that they had raised $150 million in funding. However, the problem with Xero is that they are still not profitable, while Acumatica CEO Yury Larichev claims to be already profitable with the comment, “We do not need more funding because we are already making money.” However, the latest funding will enable Acumatica to continue its aggressive growth strategy (they are on track to grow 350% again this year). When I saw the one billion revenue number, it got me wondering about the other major players in the ERP market and how much they do in annual revenue. 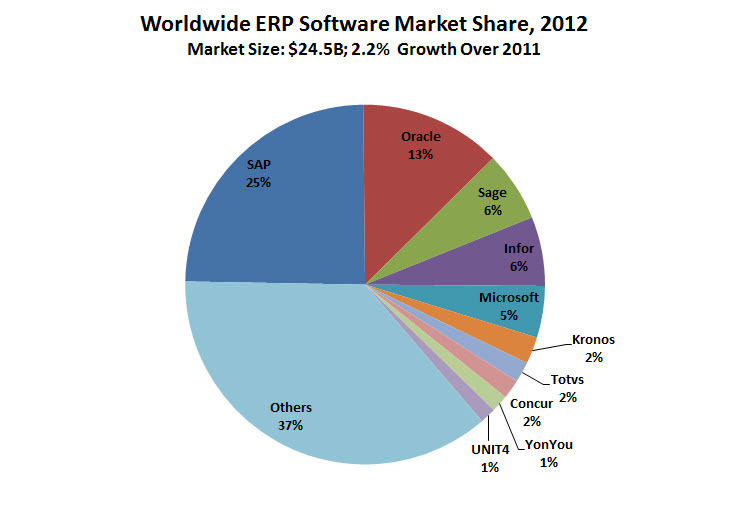 According to the graphic below from Gartner, here is a breakdown of the market share for the worldwide ERP market. I decided to focus on SAP, Sage, and Microsoft since they are the major players that I’m most familiar with. SAP is the cadillac of ERP products. They provide the most sophisticated (and expensive) solution. It looks like their most recent annual revenue number is about $18 billion (I multiplied 13.165 by a recent exchange rate of 1.37 USD per EUR). I excluded the consulting dollars because Acumatica doesn’t provide consulting, instead choosing to rely on their partner network (which I think is a great idea). I’m most familiar with Sage because most of my ERP experience is with the Sage 500 product. Sage is a UK-based company that has a number of different business software products. It looks like their most recent annual revenue is about $2.2 billion (I multiplied 1.376 by a recent exchange rate of 1.63 USD per GBP). Microsoft doesn’t publish revenue for the Dynamics division which includes their CRM and ERP products, but it looks like a good estimate is between $1.2 billion and $1.7 billion. Acumatica is one software product, while both Sage and Microsoft rely on a number of different software products in their portfolio in order to reach their revenue numbers. Sage and Microsoft got to where they are today by acquiring existing products while Acumatica has organically grown their one product from scratch.